Trained as a photographer, Tatiana Kronberg is interested in objects and the negative space that surrounds them as well as the positive form that space implies when the object itself is absent. For Kronberg the entire space around an object, and the light and shadow that it reflects, not an object itself, is of prime concern as the unrepresentable, that is, desire. Looking at photographs of luxury objects presented for sale, as well as display cases for similar products, Kronberg finds the transformative power of presentation inspiring; she wants the empty box, not the necklace. Her focus on the display mechanisms for objects (shelves at closing time, empty chocolate box inserts, velvet-lined jewelry cases) questions the nature of desire for the revered object itself. Kronberg locates a structure in these presentation devices that, when reproduced, act similar to a photograph by their continuously poignant registration of absence/nonexistence/lack. By making photographs and sculptures of these hollow spaces themselves, she formalizes the abstract space of desire. To explore these empty spaces Kronberg has made molds from, among other things, a foam mannequin’s head, a female bust and a velvet-lined pearl necklace box, which were all at one time used as support structures. By then reproducing these display devices in rubber, plaster and ceramic she renders the luxury object’s container as an autonomous object imbued with its own aura; the measure of quality here rooted in the formal elements of the created abstract space, not necessarily material value. During Kronberg’s production process, the casts and molds get continuously reproduced and confused; empty space, shadows and imprints are doubled and the resulting objects suggest a factory gone awry. 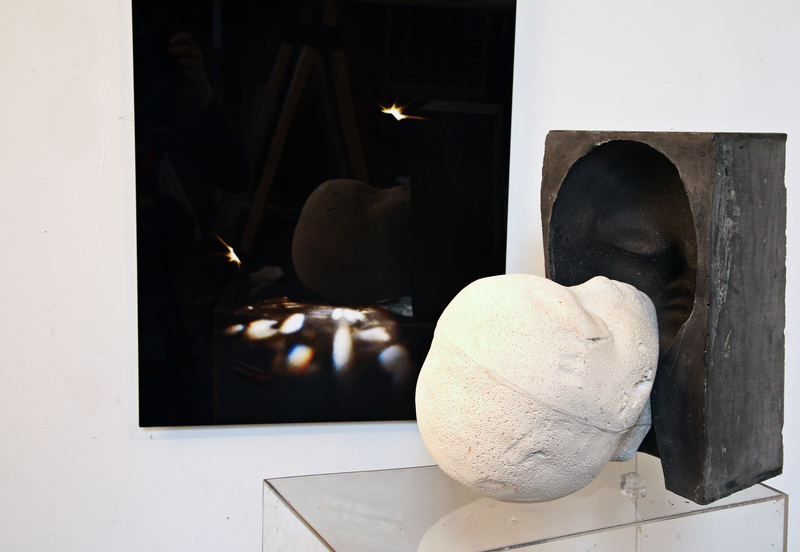 For example, in the sculpture titled, …And there’s my marble double, a heavy gray form holds its negative mirror image – a plaster cast of a foam head with rubbed out eyes, imperfections and cracks; a discarded hat display. In a slightly different twist on this idea, Kronberg has also been getting men’s bespoke shirts from the UK tailored together at the midsections. Impossible to wear with its double seamlessly fused at the navel (a stacked Siamese), the shirt’s original luxury function is disabled – and a new one, absurdly functionless, is born. Tatiana Kronberg (b. 1976, St. Petersburg, Russia) lives and works in Brooklyn, NY. Her work has been exhibited in group shows in New York at the Rochester Contemporary Art Center (2013); Bull and Ram Gallery (2013); Family Business Gallery (2012); Socrates Sculpture Park (2010); 179 Canal Street (2009); and Artists Space (2009). She received her MFA from the ICP-Bard program in Advanced Photographic Studies (2006) and a BA from New York University (1998). Chelsea Spengemann (b. 1981, Houston, Texas) lives and works in Brooklyn. Spengemann is an independent curator and researcher. She is currently preparing the exhibition and catalog, Becoming Disfarmer, for the Neuberger Museum of Art, Purchase College (2014). Past projects include The Tulsa Reader (2012), FLOAT Performance Biennial (Socrates Sculpture Park, 2009) and contributions to Rineke Dijkstra: A Retrospective (Guggenheim Museum, 2012). She received an MFA from the ICP-Bard program in Advanced Photographic Studies (2005) and an MA from Purchase College (2012).